I am starting a new feature on the blog today called the Mid-Week Mini. In this feature I will be sharing my thoughts on items which perhaps don’t need a full blown review but that I still want to talk about. 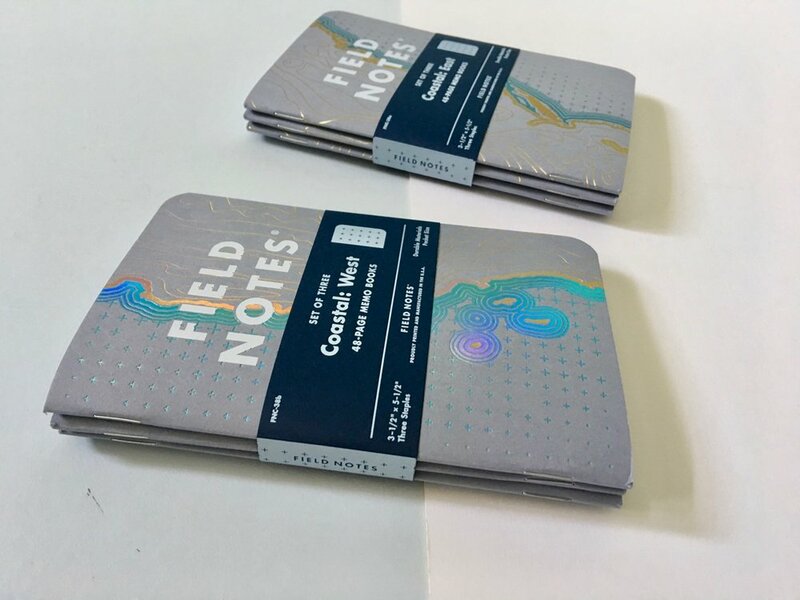 Back in 2014 this blog started with a review of the Field Notes Shelterwood limited edition, so to kick off my Mid-Week Mini I will be talking about the latest Field Notes colors release, the Coastal edition. Total spoiler: I think this is my favourite Field Notes release for some time. The covers are the real selling point of this limited edition. They are a grey-blue that is officially called Neenah Classic Crest Cadet Gray. To compliment the simple cover colour there is foil detail showing a portion of the American coastline. Which portion you get depends on the notebook you’re using. The sea/water element is a blue/green foil that catches the light and changes between the two colours. The reticle grid pattern is used in the sea and fades out as you move to the back cover. 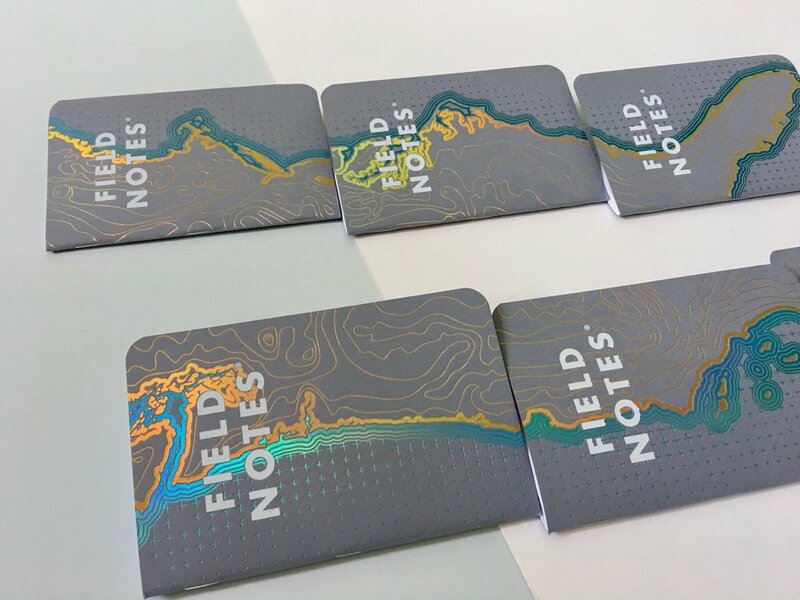 The land aspect of the cover has a gold foil with the contour lines differentiating between land and sea. The golf foil catches all sorts of colours and really stands out against the more cool tones. The two foils really compliment each other well and work so well against the muted base colour. Gold, green, blue and purple! There are two sets to this limited edition, one is the East coast of America and the other the West Coast. Each of these notebooks put together shows the entirety of the American coastline. The innards is where this edition gets weird and in my opinion loses some of its swagger. It has a reticle grid, which is controversial on it’s own, dots or grids surely? The reticle grid is printed in either a blue ink (coastal blue) or a green ink (coastal green). The colour choices aren’t so much of an issue, their tone however is. If these colours were lighter it would have really made this colors release an instant favourite. If you’re a Field Notes and pencil user the graphite gets washed out against the grid especially with some harder graphite pencils. Gel ink pens, mine has a 0.5mm, isn’t bold enough and if you use a coloured gel ink its even worse. The only thing worth using in these notebooks is a black ink with a thick line to really make your master plans legible. My go to has been a drawing pen or the Baron Fig Squire. Blue reticle grid on the left, green on the right. I tested a number of different writing tools on a double page spread which has the blue and green ink showing. Results are similar however neither grid colour is great. This release is an instant personal top 3 purely because of the covers. Despite my dislike of the innards I love this release. Over the years the way I use my Field Notes notebooks has changed a lot. A few years ago the crazy innards would have really bothered me, but now I don’t care. The cover design wins out. It’s worth pointing out that if you want to read an excellent, in-depth review from a professional then you have to read Priya’s post at The London Parchment. You get some real insight from someone in the know...go on head over.